Are You Part of a Media Company with an Agency or and Agency with a Media Business? It seems an article publishes weekly referencing media companies purchasing or building digital agencies in an effort to diversify revenue and expand knowledge base around new technology. Another popular topic these days is about agencies altering their model in order to fit the new model of advertising. A model that includes content marketing and usage of digital tools. So, we have media companies trying to act more like an agency and agencies trying to act more like media companies. The reality of this situation is related to primarily designing, creating and selling ads that have impact. Both media companies and advertising agencies want to be experts. Display ads still exist and in some cases still work great, but they are only part of a solution. In today’s ever changing advertising industry it’s critical that an advertiser feel they are getting an all encompassing solution that recognizes the need for a great ad that can reach an audience through search engine tactics, social media, content marketing, blog posts, programmatic, email blasts and a combination of other digital strategies. I mentioned a need for a great ad but what is a great ad? Creatively speaking it has to be compelling, eye catching and quickly convey the desired message. Now the hard part. Is it through video, photography, illustrations, blog posts, content written for a specific audience, social media, etc.? The answer is all of these outlets plus more. More. More. More. But how can a media company or an agency pivot to survive and thrive in this marketing world? It has to begin with a mindset change. Agencies typically focus on starting with creative design and messaging, then partnering to outsource many of the activities related to distribution of the creative. Some agencies focus on media buying to ensure all bases are covered with distribution sources or aggregation of inventory for distribution. Media companies typically try to remedy the issues with all the new ways to advertise by focusing on, developing or outsourcing a laundry list of products so no matter what an advertiser requests, they have a product to offer. In order to succeed in today’s market at an agency or media company, the mindset must be to blend. Agencies and media companies have to first start by presenting an advertiser using the worn out term, consultative selling. Agencies can’t just sell the creative and focus on the ads doing all the work and media companies can’t load up the menu with digital products and have sales or marketing representatives choose the right ones for an advertiser. Today requires anyone wanting to help a business navigate the ever changing digital marketing world or marketing in general, the ability to listen to an advertiser and conceptualize what needs to happen on social media versus search engines versus content marketing versus websites versus mobile devices and more. It’s really all about the campaign and desired impact. A thought process around the audience and how they consume information and ultimately the assets needed are the key elements long before a discussion of the tactics or products used to facilitate the desired impact. I know this may sound simplistic, consultative selling versus product selling but there’s a reason media companies are forming or building agencies and agencies are building out content and digital teams. Media companies want to be part of consultative selling which includes the creative elements including video, photography and design. While agencies are looking to be part of the entire campaign including developing content beyond just an ad and recommending distribution using their own resources It all starts with a marketing representative listening and building a campaign with multiple elements instead of just selling products the agency or media company has to offer. It’s critical for success of a media company or agency you let the client win with a successful campaign. Sales incentives for product sales or legacy knowledge should never drive the decision process in getting to a win for the client. There has been a recent surge in charts and graphs depicting the meteoric growth expected in mobile by 2016. That meteoric growth has been underway for quite some time. Mobile is exploding in every aspect, i.e. traffic, usage, downloads, and eventually in advertising dollars. You’ve probably seen the chart below, which clearly shows the massive amount of time we spend interacting on our mobile devices, against the ability of advertisers to monetize it. 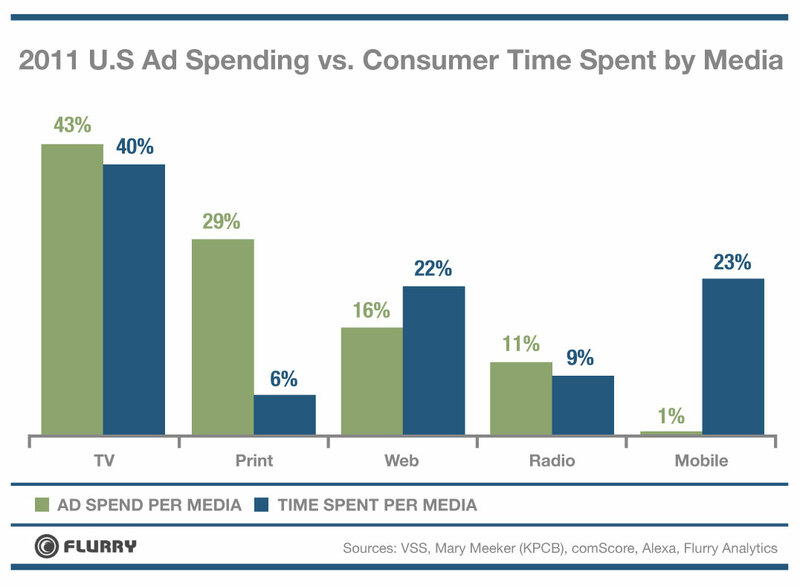 We spend 23% of our time with media on mobile, but mobile only attracts 1% of the advertising dollars. Create ads for specific devices: Recognize that display/banner ads created for websites cannot be retrofitted to a smaller screen (pretending to be a mobile display ad) as they usually don’t render well on a smartphone. Rather, once you target a specific audience, create the ad for the specific device your audience uses. There are a few exceptions, but they usually involve video. Link your ad to a mobile friendly page: If you share a link to drive users to a particular website, make sure the website is designed for a mobile device. If not, the end user will get a terrible experience; check to make sure the font is large enough to read and that most of the info isn’t hidden “below the fold”. Also, make sure that all images and links work properly! Create an experience the user on a mobile phone would expect to see. 3. Make sure your call to action is easy to get to. Once you create the mobile landing page and it links to a mobile-friendly site, you need your call-to-action to function properly with the particular mobile device. If you are driving a purchase decision, are you able to link to a well-designed mobile ecommerce experience? If you included a phone number, does it allow for a quick connection? If adding a request for contact, is there a functional link to house the contact info? Create a portfolio of different sized ads: It’s difficult to reach multiple audiences using similar advertising across platforms, and usage patterns vary based on age group. Your ads need to match your audience and they need to function well on the specific device. Also, create both vertical and horizontal versions of your ad, so users receive an optimal experience regardless of how a user is orienting their device. Provide interactivity in your ad: Make sure all advertising includes elements that go beyond just display with phone number or link; include social media links, potentially gaming elements, video and loyalty aspects. Make the user experience fun and productive. Satisfy your advertisers with quality analytics: One final suggestion is to make sure you supply quality analytics on the benefits an advertiser receives from their ads. You want them to feel good about the money they spent on it! Create a dashboard with the most important results to make it easy for an advertiser to understand the performance of the ad. To sum it up, there are many variations in functionality of an ad, depending on the device: smartphone, tablet or desktop. Be sure you understand the nuances, as it’s the only way to make a dent in usage patterns versus advertising dollars spent. I attended several meetings last week in the Bay Area and met with several companies including Google and Pandora. I’m always energized after spending time with businesses whose sole focus is on the pursuit of digital and the monetization of those efforts. During the meetings we spent a lot of time talking about the ever changing consumer behavior as it relates to interacting with advertising. As we all know, display ads are still a major component of most online efforts but with each passing day the advertisers that pay for those ads are asking for more clarity on the success rate. Jason Del Rey of AdAge wrote a good article on the subject that talked about click throughs becoming irrelevant as a way to measure the success of digital display ads. Advertisers are starting to talk more about the interaction with the ad which includes hovering over the ad, listening to audio, playing a game integrated in the ad, or other activities. I am seeing more and more advertisers asking to have their message put into the context of content on the page. Check out how SAP ad is relevant to content. Advertisers are also asking how social aspects of the content can be integrated into advertising. Think Facebook. In other words, the old way of thinking about display ads as relatively static messaging has to change if we want to continue selling to advertisers. I believe the issue of display ads not working as well as they once did is becoming even more critical when you consider the impact of mobile and tablets. Most publishers are seeing desktop page views flattening out and most growth is coming from smart phones and tablets. Now think about display ads on a smart phone. 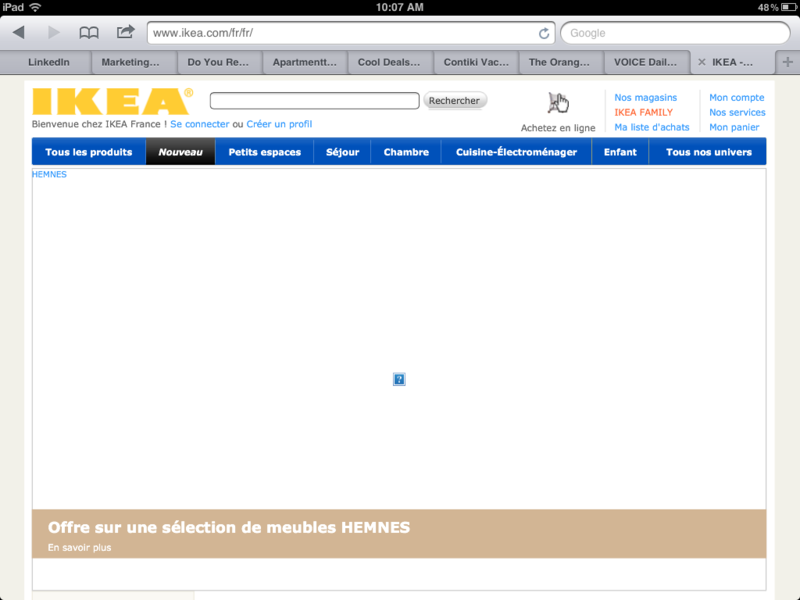 It’s a small screen and many advertiser websites are not optimized for smart phones, creating a bad experience. The answer? 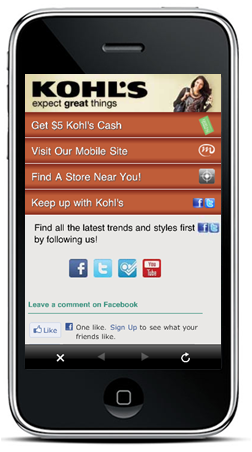 We often create mobile landing pages for our advertisers. On the tablet, display takes on a whole new meaning. Using a tablet is an engaging process; consumers are much more interactive using the device. They spend more time, look at more pages, and click on more ads. They are more likely to click on an ad if it takes advantage of the device’s technology, with interactive and social elements. Most advertisers can’t create interactive ads. They need an agency or the publisher to do that for them. Therefore we create tablet landing pages and build interactive and social elements into ads for our advertisers. There are no easy solutions. For anyone. And after sitting with the Pandora execs, one thing I know is no one has it all figured out. Pandora is doing a great job in getting an audio advertisement to your music station every 20 minutes. The ad includes a leave-behind display ad. However unless you have the phone in your hand or you’re sitting at your desktop you won’t see a display ad unless you need to access the screen itself. 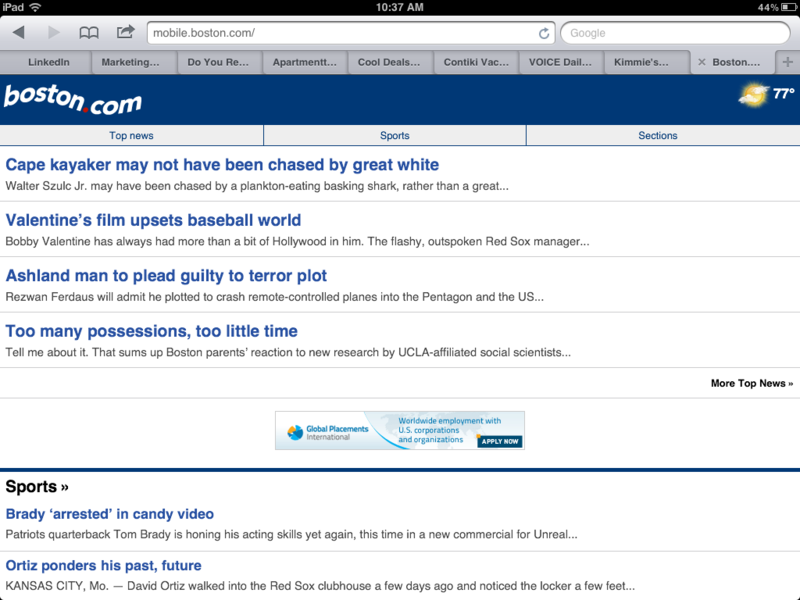 And Pandora’s ads are typical display ads that fill the screen on a smart phone, similar to a static display ad. Pandora has a compelling message and audience reach story. 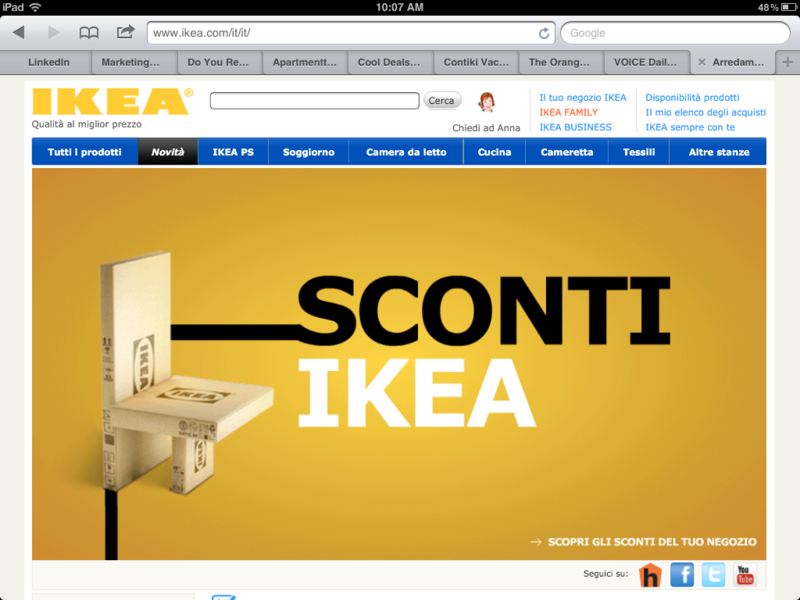 As they evolve in the space my bet is they come up with even more compelling interactive ads for mobile devices. Everyone has a chance to be successful in the mobile and tablet space as long as they don’t treat it like desktop. Pandora is making sure they don’t, and my guess is they will be a big winner in selling digital ads for their service. Google is also really pushing the envelope in thinking about mobile and tablet, but their real knockout punch is still Search. They are constantly evolving with more progressive advertising on mobile formats and no longer thinking about it as a display ad. It is going to take a combination of social, display, integrated messaging and interactive elements to win this battle. My message here is that even the big guys haven’t figured out the secret sauce as display ages and new formats evolve and progress for all our mobile devices. Keep trying new things and don’t get caught trying to repurpose old formats. I have been reading a lot lately about newspaper businesses implementing pay walls at what seems like a rapid rate compared to just 12 months ago. So, what has changed? The number one driver of this new enthusiasm is because the New York Times was able to implement a “pay fence” to its primary website with an acceptably low decline in traffic, along with more than 450,000 paid subscribers. The increase in subscription revenue has more than offset any decline in ad revenues from the drop in page views. Even though no other newspaper is anything like the NY Times, with its national footprint and millions of readers, others are following in what feels like a frenzied rush to judgment. The largest newspaper chain holding company, Gannett, announced all 80 of its daily newspapers (with exception of USA Today) would be behind a pay wall within 12 months. Lee Enterprises, owner of the St. Louis Post Dispatch as well as many small community newspapers, announced all of its dailies would be going behind a pay wall. Many others are heading in the same direction. So a little success in a big national newspaper is giving everyone confidence to move in this direction, forget the fact that the audience for digital content has been conditioned for “free” content (with ads of course). Could there be something else driving this change in attitude? Maybe, there’s a lack of new ideas on how to grow digital faster. Could it be that mobile isn’t moving fast enough and current indications are that it could be at a lower CPM than desktop web? Is it that the sales organization is now smaller and has to focus on what still drives 85% of the revenues for these companies (print)? Maybe it’s because it’s a last ditch effort to stop the slide in revenues since the economy is coming back but hasn’t really helped the newspaper industry. Or, could it be all of these things. Here are some things to think about if you are working in a media business, regardless of where you think the future will be. Are you selling advertising as if you are part of an agency? Do you offer much more than just display ads? Do you help an advertiser spend their precious $1,000 a month budget and not place 85% of it in print unless it really creates 85% of the interest? 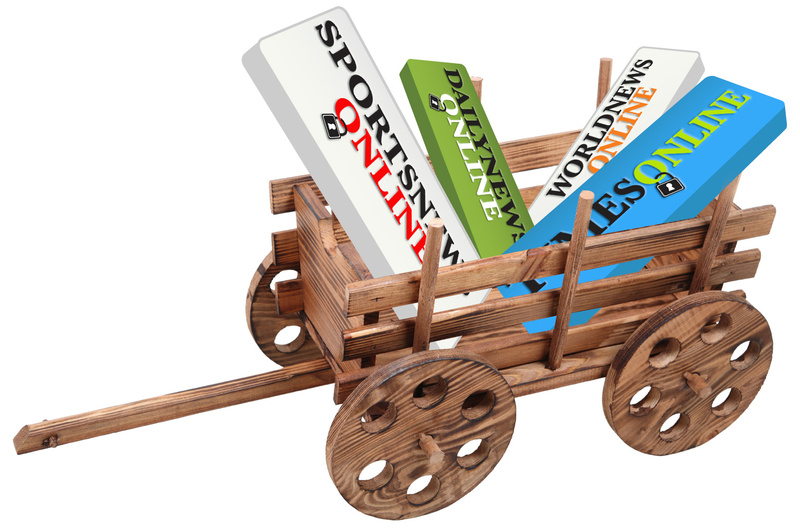 Do you offer your advertisers help in creating digital ads for web and mobile? What are you doing to help advertisers deal with social media? How are you helping advertisers be successful in search? Are you creating post campaign reports that your reps actually understand, and are able to review with advertisers to demonstrate the value of their advertising efforts? Are you selling the newest opportunity in digital (mobile) with the same sales organization that sells print, and who just recently started understanding how to sell digital ads for desktop? If so, why? What about tablets? They are sold differently than mobile. Do you know why? Are you creating content specific to the device, or is your content team putting the same content that is on the web onto mobile and tablet? What have you done to move beyond display ads for smart phones? Does your sales organization understand how to sell “share of voice?” This is the way selling advertising on tablets will be done. If you can answer positively to these questions I wonder if a pay wall is really needed? Spend some time thinking this through. We don’t want the newspaper business to be compared to Kodak. Over the past several months I’ve been invited to speak about mobile and tablet pursuits from both content and monetization perspectives. I’ve also spent countless hours with sales people discussing issues they run into when selling mobile advertising. Let me lay out the crux of the issue in a nutshell; mobile and tablet page views are growing exponentially, yet ad dollars are lagging far behind. Why is the rift so dramatic? 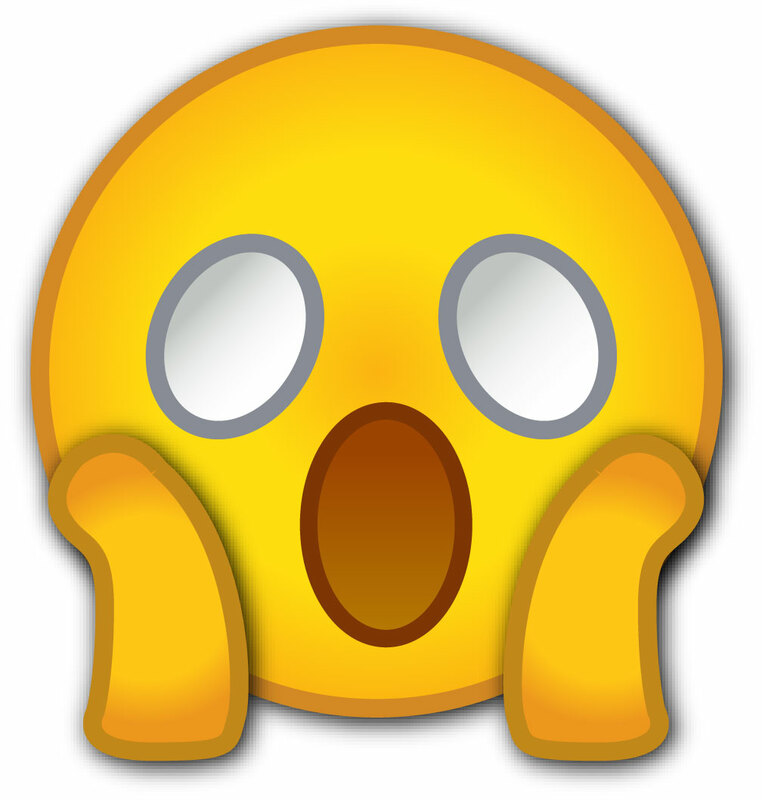 I feel the lag occurs primarily due to the lack of knowledge on the interactive aspect of mobile and tablet advertising and the ‘newness’ factor of mobile and tablet advertising in general (it’s hard to sell it if you don’t fully understand the worth and growth potential). Take a look at the following graph. It is clear to see that within mobile media the amount of dollars spent on advertising versus the time users spend with content is dramatically unbalanced compared to other forms of media. However, newspapers and magazines have the opposite situation; users spend less time with the content, but the advertising dollars are still there! It’s obvious to see that traditional media must figure out mobile as well as tablet advertising, and the sooner the better! Today, the primary advertising sold on mobile is display advertising (banner ads). Many clicks of display/banner ads are inadvertent due to the small size of the screen and therefore cause the analytics to be rather inaccurate. The solution to the issue is to create interactive landing pages – user experiences that take advantage of the features of the mobile device. 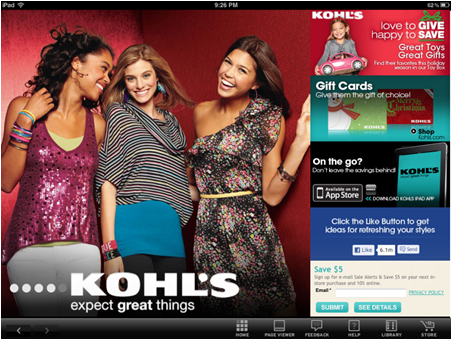 Take a look at the example below (Kohls landing page built for an iPad app). Rather than displaying a simple banner ad that runs across a small portion of the screen, we’ve created an interactive full scale landing page with maps, store locator, social media links and deal specifics. This particular ad received 11x more engagement than a banner ad that carried the same promotion. The key was building an experience for the end user, something that didn’t act or feel like a static ad. This landing page ad can still be sold using a CPM basis, but at a higher rate due to customization of the ad. When considering the iPad (or tablets in general) the job of selling and delivering ads is totally different than selling ads on smart phones. The biggest reason is due to the engagement factor of people using the iPad. A typical user spends anywhere from 10-20 minutes with most content products. A highly engaged audience expects to see advertisements, but these advertisements need to be part of the content experience. Display ads don’t cut it. Landing page advertising carries highly visual and interactive elements, tied directly to the promotion. An even more critical component to this process, is the way it the ad is sold to the advertiser. The Sales person must convey to the advertiser that the iPad/tablet is more like advertising on TV rather than advertising on a website. CPM selling doesn’t work here. 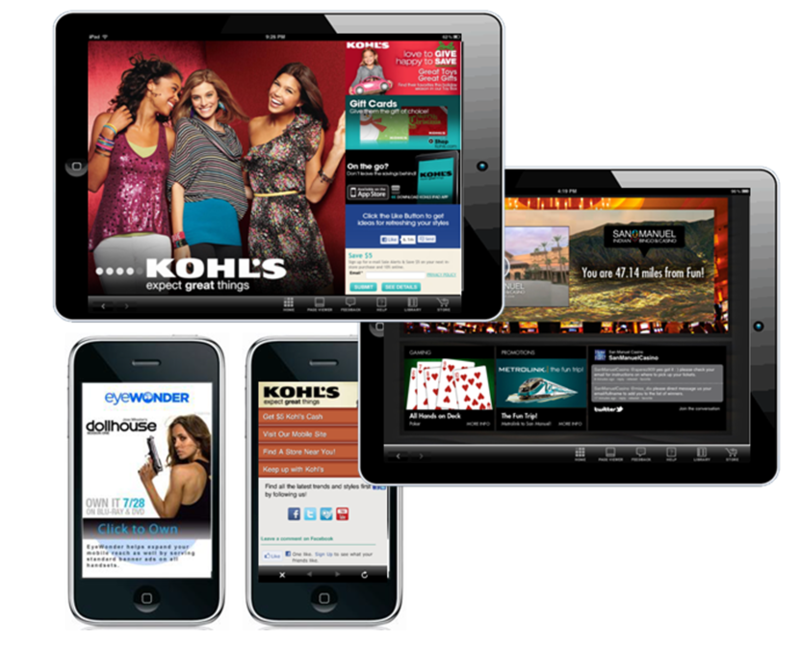 Similar to television advertising, tablet advertising is a “share of voice” type of sale. It’s more about a percentage of pages viewed or time spent by the user within the content. This means that if your product is a highly visual and interactive (with a lot of video); users are going to spend 4x as much time on average, as they do with your web product! This is where I highly suggest you learn how to sell share of voice! If you don’t, you run the risk of selling everything in a bundle format (with print and web), and consequently undervalue inventory on the iPad. How do we really get to the bottom of this issue and find a solution to the problem of selling mobile and tablet advertising effectively? The suggestion I have may be considered controversial, but here it is: you must build a separate sales group focused on mobile and tablet. The majority of traditional media businesses are just now figuring out how to sell interactive on a CPM basis. This being said, a traditional media sales rep’s plate is already full with selling print, web and other third party products. Then “BAMM!” now comes the duty of selling mobile and tablet as well. Also, it must be understood that selling mobile advertising requires a lot of hand holding to develop the interactive elements and to create something that will work on small screen. Also, tablet advertising requires a completely new way of selling and creating ads for advertisers. If you believe as I do that mobile and tablet represent the largest opportunity on both content and monetization/revenue fronts, you’ll want to avoid adding mobile and tablet to your current sales organization. Rather, you’ll build a separate sales group focused on mobile and tablet. And, of course consider mobile and tablet advertising as a big piece of the revenue growth required to get back to growing revenues.